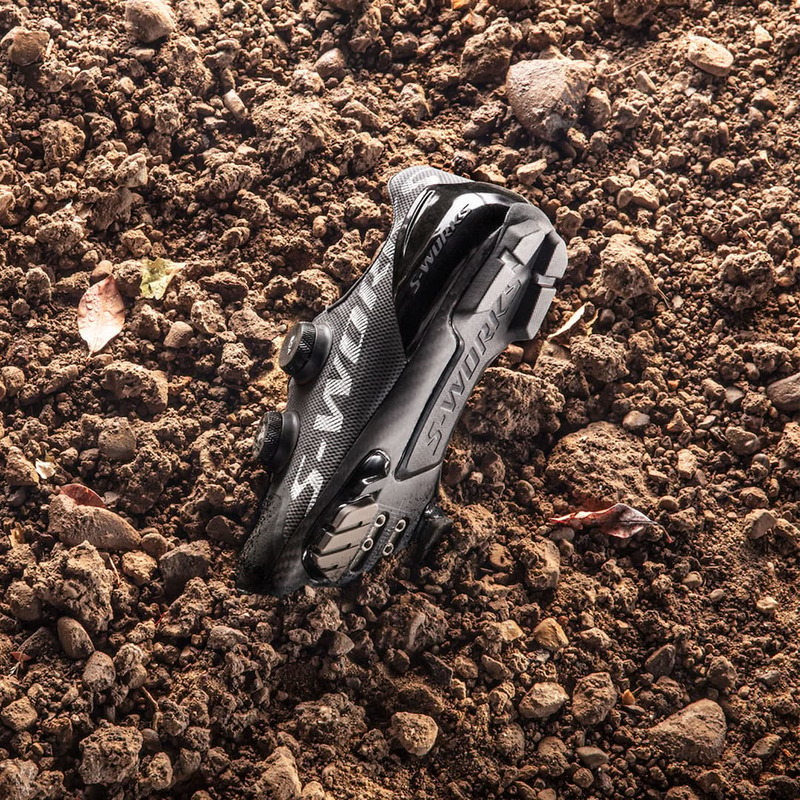 Fresh out of the oven from Specialized is the brand new S-Works Recon shoe, which is designed to be both superlight and super-stiff for XC racing. 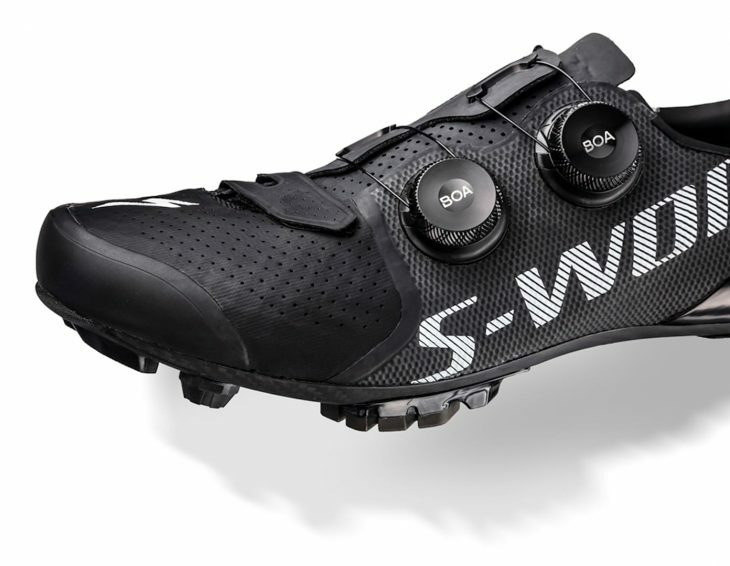 Giving the boot to the existing S-Works 6 XC, the new S-Works Recon takes place as the Californian brand’s premium mountain bike shoe for those who like to clip into their pedals. Looking at the spec sheet alone, not a whole lot has changed. 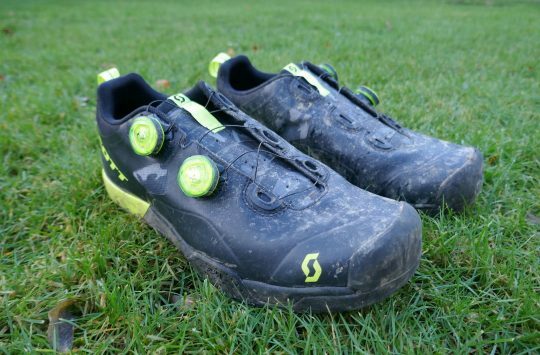 Indeed most of the ingredients (the FACT carbon sole, dual BOA dials & SlipNot rubber tread) remain the same, but the recipe has changed, with an all-new upper design that promises more comfort, and a new carbon sole that supposedly increases power output. 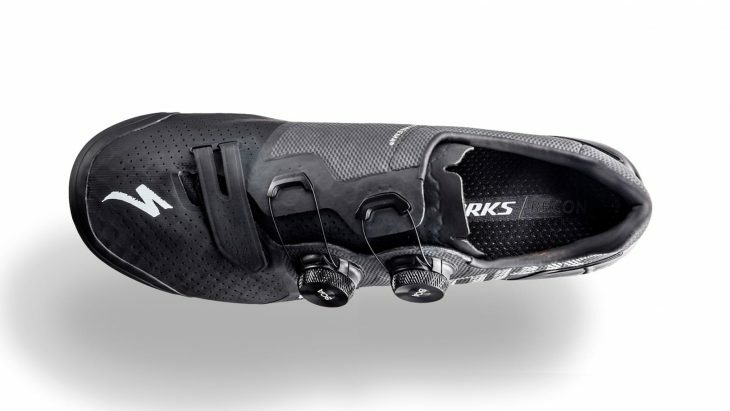 In fact, Specialized reckons that every inch of the new Recon shoe has been “ergonomically designed and scientifically tested to boost power, increase efficiency, and reduce your risk of injury“. Wow. Fresh XC kicks from Specialized. Claimed weight for the S-Works Recon XC is a feathery 270g for a size 42 shoe. Compare that with 260g for Northwave’s Ghost Pro, 330g for Shimano’s flagship XC901 S-Phyre, and 273g for a Waitrose medium-sized Melton Mowbray Pork Pie. 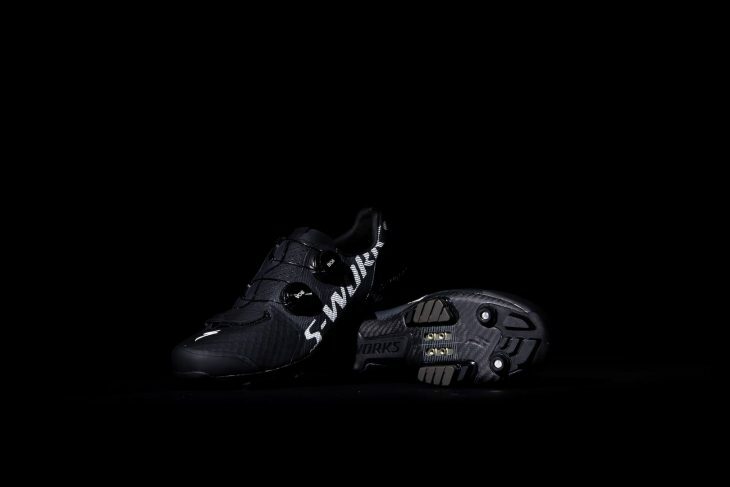 The sole is manufactured with Specialized’s own FACT carbon fibre, and it’s covered with a smattering of rubber tread blocks to provide more grip and traction when walking around off the bike. In the name of weight saving, a large portion of the carbon sole is left exposed to the elements though, so don’t expect them to look new for long if you’re trudging around on rocky terrain. Where’s the rest of the rider?? 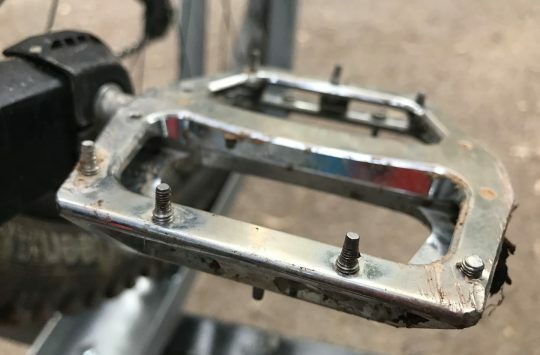 Other features include the PadLock heel design that aims to minimise heel-slip when tugging up on the pedals, a reinforced toe bumper to prevent bruised/broken toes in the event of a rock-kicking crash, and brand new S3 BOA dials that are CNC machined from alloy. Machined alloy BOA dials are brand new. 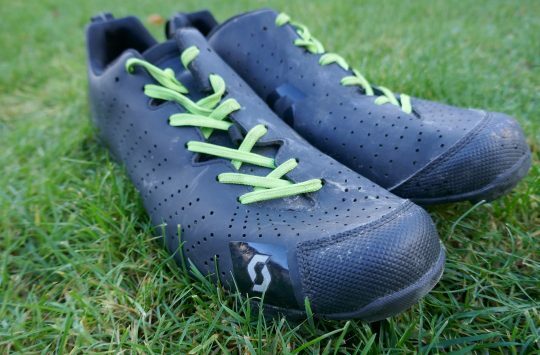 The Recon shoes are available through Specialized dealers as of right now, and will retail for £325. You can check out more of the specs below, or head to Specialized.com for further info. Specialized could really do with some new lights in their studio. No red option listed on Specialized UK website. Given the materials and price I’m surprised at the weight of these. Would have expected better. For the average Jo (unless you’re loaded), it’s a boat load of money on a pair of shoes. Don’t get me wrong they look ace and I’m sure Kate Courtney (possibly not the correct spelling), will love her free pair and she’ll notice an improvement but £325.00 Dam. Having said that I bought the Giro knitted jobs this year (which I though was silly money on a pair of shoes) and I hate to say it but they’re great so maybe £100.00 more and I’ll go even quicker!